Albert Einstein's famous theory of relativity has been borne out in the real world, measured in eclipses, distorted galaxies and even the universe's structure. We all know and love the world's favorite theory of gravity: general relativity (GR), first cooked up by Albert Einstein himself in a magnificent feat that took seven years to complete and provided amazing insights into how the world works. As good skeptics, we shouldn't immediately believe this tangle of mathematics at first blush, even if it came from the brain of none other than Einstein. Instead, we need evidence. Good evidence. Out of all the features of his new theory, Einstein was proudest of its ability to explain the details of the orbit of Mercury. That innermost planet has a slightly elliptical orbit, and that ellipse ever-so-slowly rotates around the sun. In other words, the place where Mercury is farthest from the sun slowly changes with time. If you apply simple Newtonian gravity to the sun-Mercury system, this change over time, called precession, doesn't show up — Isaac Newton's view is incomplete. Once you add in the gentle gravitational nudging and tweaking due to the other planets, almost all of the precession can be explained … but not all. By the early 1900s, it was a well-known problem in solar system dynamics, but not one that caused much controversy. Most folks just added it to the ever-growing list of "slightly weird things we can't explain about the universe" and assumed that we would find a mundane solution some day. But Einstein wasn't most folks, and he thought Mercury was giving him a clue. When, after years of attempts, he was able to flex his general relativistic muscles and explain precisely the orbital oddities of Mercury, he knew he had finally cracked the gravitational code. 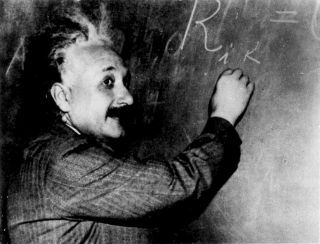 Before Einstein put the finishing touches on the big GR, he came to some startling realizations about the nature of gravity. If you're isolated on a rocket ship that accelerates at a smooth and constant 1g — providing the same acceleration as Earth's gravity does — everything in your laboratory will behave exactly as it would on the planet's surface, Einstein reasoned. Objects will fall to the ground at the same speed as on Earth; your feet will stay firmly planted on the floor, etc. This equivalence between gravity (as experienced on Earth) and acceleration (as experienced in the rocket) propelled (pun intended) Einstein forward to develop his theory. But hidden in that scenario is a surprising insight. Imagine a beam of light entering a window on the left side of the spaceship. By the time the light crosses the spaceship to exit, where will it be? From the perspective of an outside observer, the answer is obvious. The light travels in a perfectly straight line, perpendicular to the path of the rocket. During the time the light was passing through, the rocket pushed itself forward. The light will then enter the rocket at one window — say, near the tip — and exit near the bottom, close to the engines. From the inside the spacecraft, though, things seem strange. In order for the light to enter a window near the tip and exit near the engines, the beam's path has to be curved. Indeed, that's exactly what you see. And since gravity is exactly the same as acceleration, light must follow curved paths around massive objects. Another interesting result pops out of creative thought experiments surrounding general relativity. This conclusion relies on the good old-fashioned Doppler effect, but it's applied to an unfamiliar scenario. Cops can take advantage of this shift by bouncing a light off your car to catch you speeding. The next time you're pulled over, you can use the opportunity to reflect on the nature of gravity. So, if movement shifts light's wavelength, then acceleration can too: A bit of light traveling from the bottom to the top of an accelerating rocket will experience a redshift. And under GR, what goes for acceleration goes for gravity. That's right: Light emitted from the surface of the Earth will shift down into redder frequencies the farther upward it travels. It took a few decades to conclusively demonstrate this prediction, because the effect is so tiny. But in 1959, Robert Pound and Glen Rebka proposed, designed, built and executed an experiment that enabled them to measure the redshift of light as it traveled a few stories up the Jefferson Laboratory at Harvard University. Even with all that evidence, we continue to put general relativity to the test. Any sign of a crack in Einstein's magnificent work would spark the development of a new theory of gravity, perhaps paving the way to uncovering the full quantum nature of that force. That's something we currently don't understand at all. But in all regards, GR passes with flying colors; from sensitive satellites to gravitational lensing, from the orbits of stars around giant black holes to ripples of gravitational waves and the evolution of the universe itself, Einstein's legacy is likely to persist for quite some time. Learn more by listening to the episode "Seriously, What Is Gravity? (Part 2)" on the "Ask a Spaceman" podcast, available on iTunes and on the web at http://www.askaspaceman.com. Thanks to Andrew P., Joyce S., @Luft08, Ben W., Ter B., Colin E, Christopher F., Maria A., Brett K., bryguytheflyguy, @MarkRiepe, Kenneth L., Allison K., Phil B. and @shrenic_shah for the questions that led to this piece! Ask your own question on Twitter using #AskASpaceman or by following Paul@PaulMattSutter and facebook.com/PaulMattSutter. Follow us @Spacedotcom, Facebook and Google+. Original article on Space.com.